RIP Lynne Stewart, People’s Lawyer & Fmr. 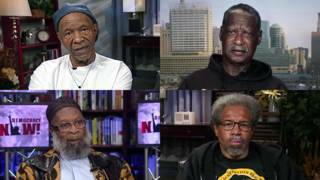 Political Prisoner; Watch Her Interviews & Release in 2014 | Democracy Now! Radical civil rights attorney Lynne Stewart died Tuesday at her home in Brooklyn from complications of cancer and a recent series of strokes. She was 77 years old. A former teacher and librarian, Stewart was known as a people’s lawyer who represented the poor and revolutionaries. Many considered her a political prisoner herself when she was given a 10-year sentence for distributing press releases on behalf of one of her clients, Omar Abdel-Rahman, an Egyptian cleric known as the “blind Sheikh,” who was convicted of conspiring to blow up the United Nations and other New York City landmarks. Democracy Now! first interviewed Stewart about the case in 2002. We were also at the court house in 2006 when Stewart was first sentenced. In 2009, Stewart spoke to Democracy Now! in her last broadcast interview before beginning her prison sentence, explaining the background to the case and why she had been charged. “We found out later that the Clinton administration, under Janet Reno, had the option to prosecute me, and they declined to do so, based on the notion that without lawyers like me or the late Bill Kunstler or many that I could name, the cause of justice is not well served. They need the gadflies. In 2010, Stewart was re-sentenced to a 10-year term, nearly five times her original sentence, after an appeals court ruled her original punishment was too light. While held in federal prison for nearly four years, Stewart suffered from stage IV breast cancer that metastasized, spreading to her lymph nodes, shoulder, bones and lungs. She was given 18 months to live. Calls to grant her compassionate release came at a time when the Federal Bureau of Prisons faced increasing criticism for refusing to release terminally ill prisoners. In 2013, we spoke to former U.S. Attorney General Ramsey Clark and Democracy Now! producer Renée Feltz, who went to Texas to interview Lynne Stewart in federal prison, the first face-to-face interview granted to a reporter. We also interviewed Stewart’s husband, Ralph Poynter, and her daughter, Dr. Zenobia Brown, who is a hospice and palliative care specialist with a master’s in public health. Poynter cleared up a common misconception about Stewart’s comments after her original sentencing. RALPH POYNTER: What she had said, “As many of my clients have said to me when they received a sentence that was less than possible—possibly expected, 'I can do that standing on my head. '” Now that’s a big difference than saying, “I can do that standing on my head.” And if you go back and review the tapes, it is very clear what she said. And she began by thanking the judge. And all of this has been skipped by the media, who has lied about what Lynne said. After months of campaigning, a judge granted Stewart’s release, and on New Year’s Day, 2014, Democracy Now! was at the airport when she triumphantly returned to New York, and was met by her family and friends. LYNNE STEWART: —or as suddenly. It’s like bursting on me, you know? I mean, yesterday at this time, I was deep in the dungeons, and here I am in my beloved New York. It’s just wonderful. I can’t tell you. Watch all of our interviews with Lynne Stewart.